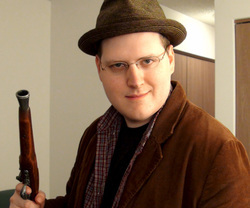 Lewis Lovhaug is best known in the online world as "That annoying guy in the hat who makes fun of bad comic books. ", and that's usually why he goes by Linkara instead. On his show, Atop the Fourth Wall, he's battled against mad scientists, inter-dimensional conquerors, giant robots, and Lovecraftian abominations, yet this is still a show about comic book reviews. He is featured on ThatGuyWithTheGlasses.com, where his fellow reviewers have been known to say about him: "Dear God, shut up about Cry for Justice already." as well as remarking about him: "Wait, people still read comic books?"